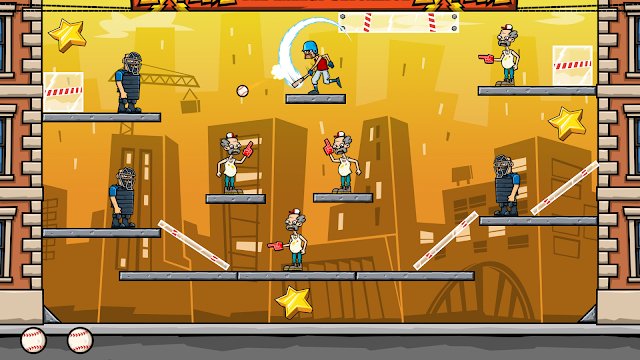 As a physics-based puzzle game, Baseball Riot delivers the sort of brain teasing if repetitive gameplay one would expect from a game that looks and plays like a simple mobile port. If games like Angry Birds, now with angrier moustached ex-baseball players appeals to you, then Baseball Riot should deliver a few hours of gameplay. However, there is really nothing new here that the genre has not seen before and it offers only a minimal amount of depth from start to finish. 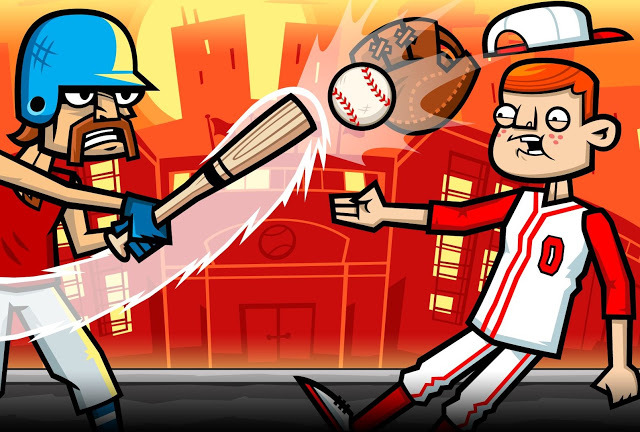 Related reading: Sam's review of the Xbox One version of Baseball Riot here. Kudos at least, for trying to come up with a fun theme. Mind you, nothing is done with that theme as the story is nonsensical stuff as you take the role of Gabe Carpaccio as he makes his way through the United States on a one man quest to take down the evil Explodz energy drink empire (reminding me somewhat of Sunset Overdrive for the Xbox One, except less awesome). How does he do this? By swinging a bat and slamming baseballs into people, of course. If the above premise sounds absolutely ridiculous, I did my job in describing it. The core gameplay is little more than lining up where Gabe will hit a baseball in an effort to knock down evil Explodz underlings while doing his best to collect stars along the way. If the idea of spending several hours lining up trajectory based shots appeals to you, then Baseball Riot should deliver in spades. However, I found it to be rather repetitive far too quickly, despite some efforts to spruce up the levels. By and large, completing a level is in and of itself not terribly difficult, though if you are aiming to take down all of the baddies while collecting all of the stars that are lying around the stages for bonus points you might find some levels particularly challenging. There are some quality of life options that help to make Baseball Riot more enjoyable. You can quickly restart a level at any time, which is great since I spend a lot of time lining up my first hit a certain way, and you only have so many balls per level. Also, you see a faint dotted line that indicates your last shot, so if your next one needs only minor adjustment, you can tweak it accordingly. Also, every time a new gameplay element is introduced, you get a brief tutorial on how the mechanic works. 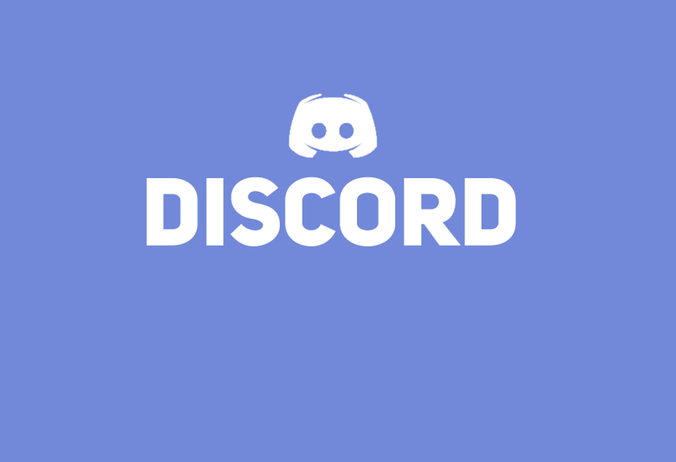 It is really somewhat unnecessary, as even the most inexperienced gamers out there have surely seen it all before, but it is still nice that the developers wanted to make their game so accessible. Related reading: Tennis In The Face was developed by the same team. Hamza's review of the PC game can be found here. Baseball Riot is also helped by the expected changes in the level design along the way. What starts off as pretty basic shots early on, with a lot of straight lines and minimal angled shots soon becomes littered with explosives, angled corners for creating bank shots and different enemies from robots to guys with baseball gloves who will snag a ball out of the air before letting it him them in the face. Because of these predictable factors, Baseball Riot is entirely fair though it also demands a boatload of trial and error. It is really frustrating to line up two perfect shots only to have the third one go slightly awry and cost you that perfect level completion. Even so, breezing through all of the stages only takes a few hours of steady gameplay. By the end, I blinked my weary and dry eyes and realised I had sat through the entire game start to finish in a sitting. I strongly advise playing in smaller doses, as that may cut back on the repetition, though I have no doubt staying with it the way I did allowed me to tackle the puzzles more quickly because my brain was already tuned into the mechanics. To that end, Baseball Riot is a perfectly competent game, but it suffers from a lack of originality. The visuals and ridiculous story have a certain charm to them, but at the same time, I never really came away feeling as though I had a lot of fun while playing. By the end of the game, it was more a matter of going through the motions - almost compulsively gathering up stars and performing headshots on bad guys (using a baseball, mind you). The brightly coloured visuals and wacky enemies provide enough visual variety to keep things more interesting than they might have been otherwise, but the uninspired gameplay lets Baseball Riot down in the end. Item Reviewed: Review: Baseball Riot (Sony PlayStation 4) 9 out of 10 based on 10 ratings. 9 user reviews.